First China (Huludao Xincheng) International Swimsuit Festival will be held in northeastern China's coastal city of Huludao from August 16 to August 17, said its preparatory committee at the press conference in Beijing on Monday. Bearing the notion of "Beauty leads the fashion; Dream lightens the life," this festival is to showcase the city's renowned swimsuit industry along with its trendy products. China currently leads the world's swimwear industry. China makes more than 70 percent of all swimsuits in the world, in which Huludao's products account for 38.7 percent. 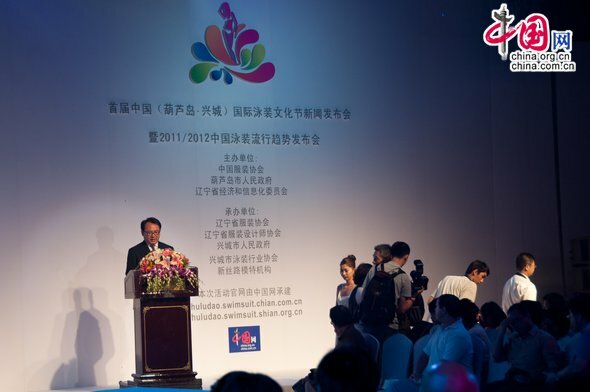 This swimsuit festival features public participation, said Du Benwei, Acting Mayor of Huludao. "We will stage beach volleyball exhibition matches and mass bikini parades," he said. In addition, the municipal government is also looking to make the international swimsuit festival a lasting tradition to be held in August each year. In developing the swimsuit industry, Huludao, the city that faces the Bohai Bay, is transforming itself from a sheer heavy industrial hub into a modern metropolis with various and complementary industries, such as tourism and transportation, blessed by its geographical location and cultural deposits. In addition, Huludao is also the hometown of Yang Liwei, China's first man into the space.